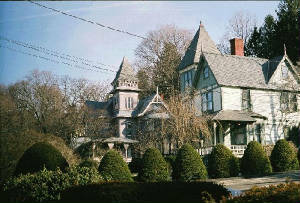 A wedding present from George Sykes to his daughter Elsie and son-in-law Charles Phelps, the lot on which this house stands is across Ellington Avenue from George Sykes' home. Phelps was the first Attorney General of Connecticut. Dedicated in 1924, this manual training and high school on Park Street is a memorial to George Sykes. Only the facade remains, the rest of the building has been replaced by a new state courthouse. Excellent examples of the Queen Anne style, these houses were designed by the prominent architectural firm of Palliser, Palliser & Co. of Bridgeport, CT.